The past week has been one of those where I kept telling myself “Holy Cow, this sure is bike touring!”. I finally got my package from Optimus stoves in Loja, so am back in business with plenty of O-rings to last me for quite a while. 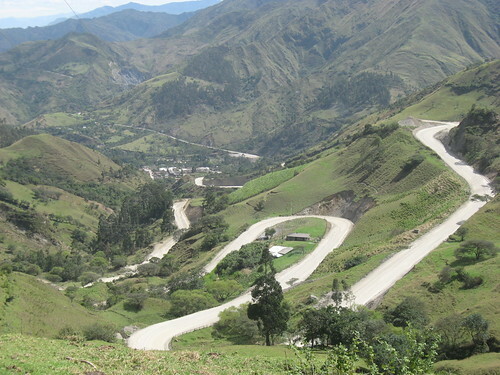 In Loja, I had to choose between essentially two routes to Peru. On the advice of several cyclists, I decided to take the more arduous dirt road. Everyone said it was worth the effort. My trip from Cuenca to Loja was on very new road, with a fair bit of traffic, and lots of cold drizzle at the top of every big climb. I had hoped for some blue skies my last days in Ecuador, and got just this! Heading south from Loja, the pavements ends in Yangana. 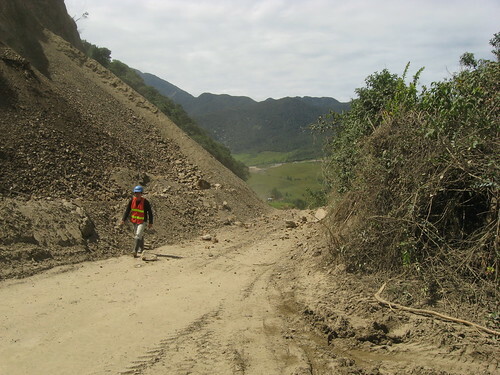 After a short day from Vilcabamba, I got to Yangana and knew the road turned to dirt. The dark clouds up ahead in the mountains made me call it quits for the day, and I found a very basic room for the night. Of course it could rain continuously the next day or week, but the gamble paid off and the next day I awoke to sunny weather. Time to tackle the hills! The first few miles out of Yangana had a continuous stream of dump trucks carrying the never ending piles of dirt that slide down onto the road. But once I got past the turnoff for the dump pile, the road was so so quiet, I encountered only a few cars and buses that afternoon. There were four big climbs and not too much downhill, meaning I gained lots of altitude in a few hours. I actually had to put my jacket on at the last pass. 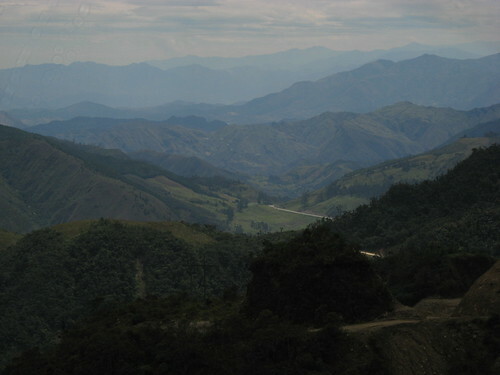 Here I could barely make out the valley that Yangana sits in behind several ridges. Then a few more miles and I caught a glimpse of Valladolid and Palanda way down in the valley, then next two towns on the dirt road. There weren’t more than a few houses between Yangana and Valladolid, but several crystal clear streams which I drank from, and survived. It is funny to think that in even in Alaska, Canada and the wide open west of the USA, I was rather diligent about treating water, but after Colombia, where all the small towns tapped the streams from the hills, I’ve been less inclined to filter water. So far so good, but I may pay for this later on with a bug of sorts. The descent from the hills down to Valladolid wasn’t easy, the rocky narrow road means you have to go real slow and stop once in a while to let the brakes cool down. A much needed lunch in Valladolid, then another easy mostly downhill 10 miles to Palanda. All in all, probably my favorite day in Ecuador! More great weather for the next day from Palanda to Zumba. 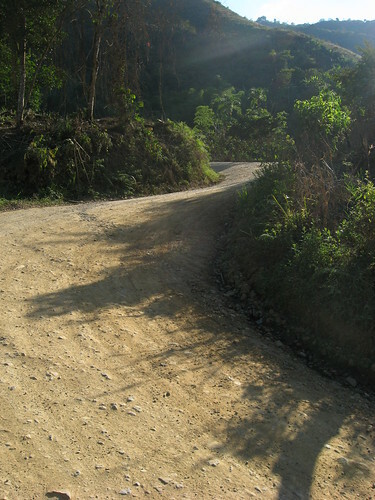 Also more steep dirt road, with a long uphill at the end of the day to get to Zumba. Not much going on in Zumba, the last real town before the Peru border. Used up the remainder of an Ecuadorian phone card to call my aunt in Quito and then my parents in Chicago. 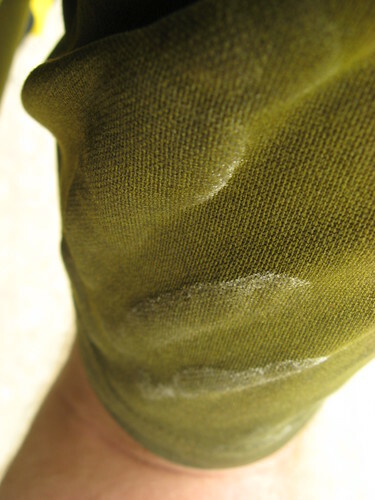 More sunny weather the next day to the border, but no pictures aside from the salt colonies growing on my shirt. When I’m tired and the road is tough I start to lack the initiative to take pictures. I got to the border, the quietest so far on the trip. The only traffic I saw cross were a few motorcycles, but no cars. I didn’t see any Peru plates in Ecuador, or vice versa. Quite different from what I’ve seen at various Mexico-USA border towns. The officer to stamp me out of Ecuador was nowhere to be found, so I decided I’d find some lunch. I walked into one place and there was a young lady sitting at a table, slicing away a big tub of meat. There was a guy sitting with her as well. I asked what there was to eat, she said “Chicken”. I asked if she could fry some eggs instead. I generally avoid meat, twice now on this trip I’ve gotten food poisoning from meat, and figure eggs are a safer choice, and plus you always know what part of the animal you are getting served! So anyway, I asked if they had eggs and they look at each other and burst out laughing. I let them giggle and then matter of factly stated “Look, I’m not sure what is so funny, that wasn’t a joke, but a question”. Either customer service in this border town means laughing at potential customers is acceptable (not so likely), or more likely, laughing at foreigners is acceptable. The lady went back to the kitchen and came back, and said that there weren’t any eggs. Once again I ask what is so funny but of course they did not have an answer and just stared at me. Finally I got stamped out of Ecuador, then found another eatery where I could spend my last spare Ecuadorian (American) coins at. Fried eggs were not a problem here. I headed to the migration building on the Peru side to get stamped in. The first thing the office asks me when I tell him I’m on a bike is if I had any insurance for the bike “just like a motorcycle or car”, he said. I told him I’d been travelling for over a year and a dozen countries and that no where had required insurance for using a bike. ”But surely you need insurance in your country, what if you get in an accident?”. Early on we established he wasn’t talking about medical insurance for my person, but rather for the use of the bike. That much we agreed on. ”The transit code says you need insurance”. I also mentioned that I had several friends who had passed through here on bikes, and no one had mentioned needing insurance. “Oh, well then I guess they forgot to tell you, right?” This was my first clue that he wasn’t a poorly trained migration officer, but rather, one on a power trip of sorts. I asked him if any Peruvian that gets on a bike has to have insurance, he said no, just foreigners. I conceded and said “Look, I’ll find some insurance the next town I can”. This pleased him. Another debate was had as to how many days I could get. He originally offered 90, but I asked if I could get 180, as this was the maximum, and my other cyclist friends had received this much. He told me that it is 180 within any calendar year, but since we were passed the halfway point of the year, I could only get 90. I do hope to be done with Peru within 90 days, but wanted the max just in case. Finally he gave me 150, which contradicts his early explanation. Then began the filling out of the form. I filled it out and then he compared it with my passport. I had never noticed that my most recent passport doesn’t have my mom’s maiden name, which all my old passports do. He stated that if it wasn’t on my passport, I shouldn’t put it on the form. Fair enough. So I filled out a second one, and realized I made the same mistake again further down the piece of paper. I apologized and said, look I’m tired, I’ll just fill out another one. ”For this you will be fined two dollars, one for each form”. I rolled my eyes, to myself at least. I filled everything else except the name part out, and let him do it, unwilling to be told I’d made another mistake. I had the gall to ask him where it says it costs a dollar for each extra form, and he points to a wall full of printouts of all the official migration laws printed out in colorful mix and match of WordArt fonts. As hard as I try I did not see this rule, but play into the game and say “Oh yeah, there it is”. Of course he doesn’t have change for my $5 so he settles on 5 soles (less than $2). I wasn’t about to ask for a receipt for this “official” transaction. I wasn’t going to put up more of a stink as he could have found any reason not to let me into his country. All this while he is blasting away sordid radio hits from years past (Dame Mas Gasolina for goodness’ sake), and of course not wearing any uniform or name badge. I’m not saying that the US, Canada or Mexico have the fairest of migration officers, but when you show up in their offices, you are at least greeted with a facade of professionalism. But I guess when crossing from Ecuador to Peru on a quiet dirt road, shoddy service is what you get. All part of the adventure. From the border at Las Balsas a few miles to Namballe. It was late in the afternoon so I found a room for the night. This is one of those times on the trip where I just stopped for a second, looked around, and said “boy, I really do feel out of place here”. I couldn’t walk around the corner without every single person staring. But later that night ran into a very friendly shopkeeper and his nephew, and this mostly made me forget the unpleasant migration officer. They asked me all sorts of questions about travel on a bike and about life in US and Mexico, among other things, how much cows cost there and how much one could make growing potatoes. I said I was sorry but had no experience with either things! By the time I left Namballe I had been on the road for 6 days, which isn’t usually that much, but the last few days I’d been loosing my steam after all the tough dirt roads. The 28 miles to San Ignacio were very slow. The last few days have been rather warm after dropping down from the mountains in Loja. But unfortunately a cold drink has been tough to find. Unlike most of the larger towns that will most likely have a Coca Cola or Pepsi fridge, and the obligatory beer fridge with the digital temperature reading on the outside, you are lucky if the only store in town has a fridge at all. If it does, it is like a home kitchen fridge, and often times just used for the shelf space (why buy the fridge in the first place???). Yes my friends, for better or for worse, there are corners of this world that Coca Cola has forgotten. Asking the storekeeper if the drinks are “frio” (cold), is of no use, as cold to them means barely above room temperature, then they say, oh you mean “helado” (freezing or ice cold), “no we don’t have anything helado”. I know I’ve only been in the country for two days, but the shouts of “Gringo! Gringo!” are back in full force and persistent in towns of all sizes, and from what other cyclists say, will continue for quite a while south. As such, I get to practice my responses to this greeting. One is to just shout “Gringo!” back. Another is to shout “No soy gringo, soy Mexicano [I'm not a gringo, I'm Mexican]“. Or stop and say “No me llamo Gringo, tengo un nombre y es Mateo [My name isn't Gringo it is Mateo]“. I usually use this ones for adults, who I feel should know better. Sometimes I ignore it all together. I know this is simply what is acceptable to do when a foreigner on a bike rolls into town, but in very rare cases is it endearing or does it feel very welcoming. But really it doesn’t even make sense. I’m not questioning the choice of the word “Gringo” as much as what the point of doing so is. 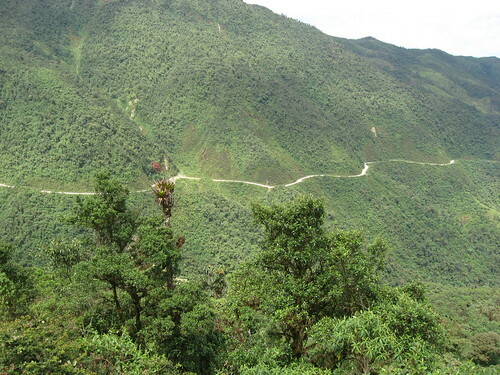 Anyway, Peru is one big country and progress is going to be slow along the tough mountain routes I’ll be taking. But for now am looking forward to the adventure. 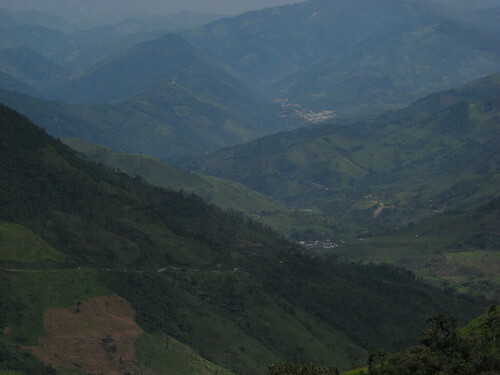 From here I head up to Chachapoyas and hope to visit the ruins at Kuelap. PS I worked on getting the last 4 months of pictures up to my Flickr account. At last! Now you can see all the pictures from Central America. Click [here] for the Flickr page from the trip. Your last chance for an ATM is Loja or Vilcabamba. The first ATM in Peru was San Ignacio (main square), although it didn’t take my card for whatever reason (which is Cirrus/Mastercard network). When changing money at the border or San Ignacio, expect them to only take crisp US dollars, or give you a worse rate for bills with even small imperfections. 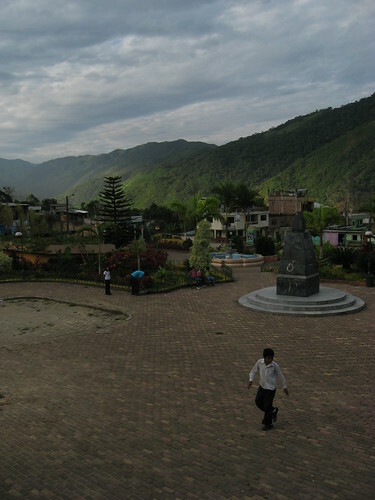 In Vilcabamba, an option is Hostal Mandango, behind the bus station. Tell the friendly owner you were referred by past cyclists and he’ll likely charge you only $5. Kind of on the run down side. In Yangana, the room for rent is above the store on the corner of main square, very basic, $3. Ask anyone where it is. In Palanda, Hostal Merino on main square should charge you $5 for a room, shared bathroom, rather poor ventilation inside room. Several other options in town. In Zumba, the hostal a few doors down the block from the main square in front of the military barracks has some airy rooms on the top floor, shared bathrooms, $5. Internet is slooooow in Zumba. To leave Zumba, you basically have to go to the other end of the airstrip where a new building (terminal?) is being built, and head downhill from there. Ask if unsure. There is a military checkpoint a ways past Zumba, take a right after it. The soldiers gladly gave me juice and water, but so you know, there is a steep push after it over a ridge. Right after the ridge is a downhill into a little town with a basic store. In Namballe, when you get to the main square, if you ask for a hospedaje you may be pointed to the one above the hardware store on the corner. 15 soles, no water tank so fill up your reserves for cooking, as it will likely be gone in the morning. Just around the corner, however, is the “main street” (didn’t look like it at first glance), there are several more hospedajes that might be a better deal. The hardware store a block or two from the main square sells gasoline. 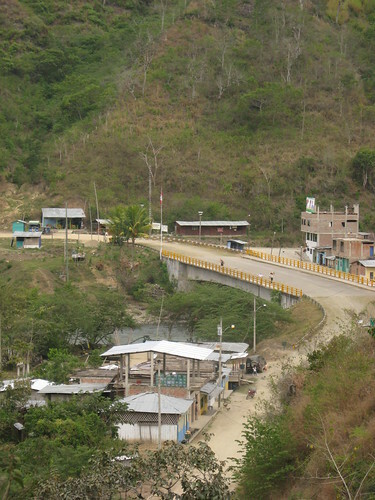 Several towns between Namballe and San Ignacio, so no need to go too crazy carrying water. I was fortunate to have sunny weather on the dirt road, and can only imagine things would be much more difficult when wet and muddy. Check other Crazyguyonabike blogs for more descriptions of the route and distances. 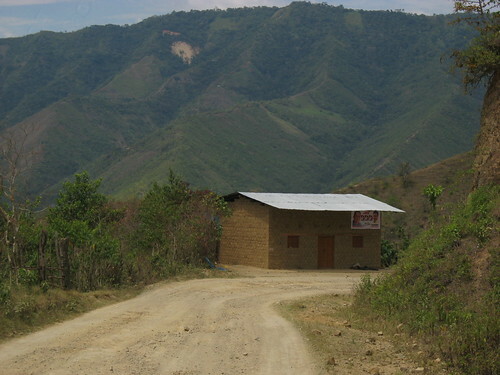 As for going from Peru to Ecuador, just be warned that the first few miles north of the border in Ecuador are extremely steep, don’t assume it is all this bad, but that isn’t to say it will be great the other way either. In San Ignacio, at least a dozen lodging options. First night I spent at hospedaje Santa Rosa II (no idea what Santa Rosa I is like…), half block south (downhill) from the big church one the two-way avenue. 15 soles shared bathroom, quite clean, firm foam mattresses, newish building with a fresh coat of paint in rooms. Further past Santa Rosa II is a large hotel, no idea of prices, probably a splurge. Next two nights I spent at hotel La Posada as there is an internet cafe on the first floor and they were happy to give me the code for the wifi connection. La Posada is located a block north (uphill) from the main avenue, just east (away from the square) of the chifa place on the main avenue. Cheap 5 soles almuerzos can be had at many eateries, but a 1/4 roast chicken with delicious fries can be had at La Caravana for 10 soles, right by the Banco Nacional on the main avenue. Incidentally, Banco Nacional always has a hundred people lined up outside, so if you want to feel like you are on parade and get stared at, just walk by (may only apply to those with grubby beards, who knows)! Also, try the Pilsen Polar, a national dark lager (still no ales anywhere, oh well). If you are a map fan, go to Saja cafe, just off the northeast corner of the main square. In the back there is a huge topo map with excellent detail of the local roads (switchbacks and all!). I looked into it, it seems to be produced for a local tourism project, and from research online doesn’t look like you could find one like this for the rest of the country. Too bad, really good map. Wow sounds kind of different from Ecuador. Hope it’s all the good kind of different. Hola sobrino! i just finshed a long comment and it disappeared! enjoyed the description of your border crossing!! what a deal! Yangana looks amazing..Carlos has been there. I was in the livingroom when the tremor hit…wondered why i was moving and who was coming in the front door until i saw the lamp swinging!! thot that you would have probably felt the jolt also!! pray for you often…you are on an amazing adventure!! Can’t wait to get a taste of this side of Ecuador. Thanks for taking the time to post all the cyclists tips. Hi Amaya, good to hear from another cyclist on the road. Might I run into you at some point? Just checked out your site. Thats a GREAT road, isnt it !! he he. I hope you enjoy the road ahead… i know i did, the views are amazing.Ive had good weather all the way in Peru so far, and hope it holds for you. Hi Yvelise. I actually got to meet Juan Jose in Trujillo, at the Casa de Ciclistas. He’s now a ways ahead of me but I do hope our routes cross sometime, maybe in Bolivia.